Last month I had the pleasure of working in our new John Lewis, selecting outfits for an upcoming Style Presentation. It gave me a chance to have a good furtle through the brands and one that caught my eye was the Bruce by Bruce Oldfield collection. There was something about the collection that really appealed to me. When I look at a collection it’s not always from the perspective of what I may choose to wear but what may appeal to my clients and what it offers in addition to what is already available on the High Street. There are the usual suspects when it comes to something on the smarter side of casual, or party wear, such as Coast, Reiss, Karen Millen, Hobbs, Phase Eight and so on but in some ways they can be ever so slightly predictable and there is always the chance that you will rock up somewhere feeling a million dollars, only to be dressed exactly the same as someone else. And that’s that million dollar feeling RIGHT down the pan. Anyway, let me show you what I mean…. 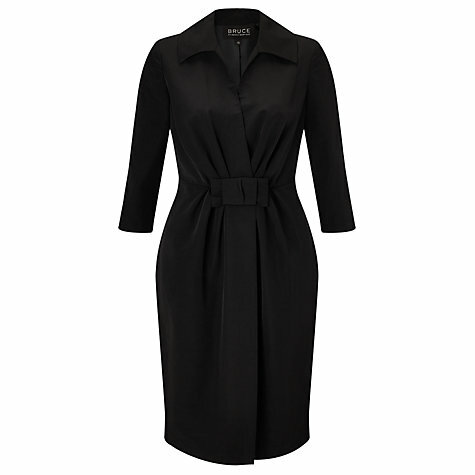 Starting with a fantastic wardrobe staple, this black bow dress by Bruce Oldfield (£99). The fabric has a lovely sheen to it and the shape is fabulous. It just seems to be designed for those ladies who often find it hard to find a dress in a shape that works for them and who look brilliant in a dress that really does work for them – the Nigellas of this world if you like. The sleeves finish at a great point on the arm, the v-neck flatters a curvy bust and it nips in brilliantly at the waist. 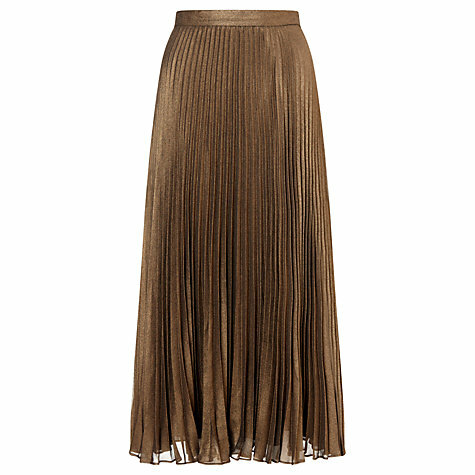 I saw this bronze pleated skirt by Bruce Oldfield (£99) when I was in John Lewis yesterday. I think that it’s new to the collection and I really loved it. It’s great for those who would like to avoid black and the fabric is fluid, making it really flattering. 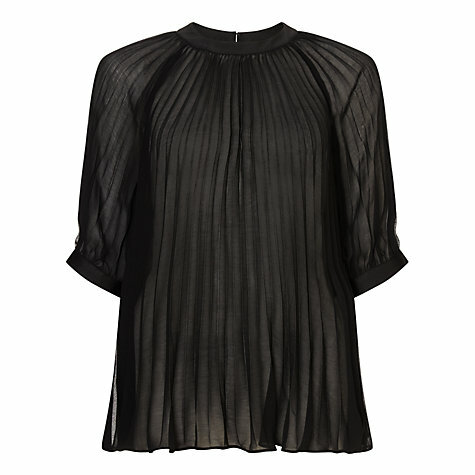 It comes with a pleated top (£89) which is also in bronze. I’m less convinced about the two together as the top is quite long and hard to carry off unless you have the height of a model. Tucked in, it may work better or the skirt would look great with a more fitted top, such as this Bruce Oldfield metallic jumper (£59) which also comes in cream. The Sunday Times Style Magazine featured a selection of pleated skirts, some with tassel or pom pom shoes and they looked fab, should anyone need any shoe inspiration. This print foil skirt (£130) is a great shape for showing off a slim waist whilst at the same time skimming over the hips. Whether you like the foil detail or not I guess is a personal issue but personally, I like it. For something a little more contemporary, I really like this Bruce Oldfield velvet panelled dress (£199). The length keeps it on the right side of what I would prefer to wear now but the shape, fabric and neckline keep it really modern. The horizontal lines across the hips won’t make it the easiest dress to pull off for all shapes but for some, it will be perfect. 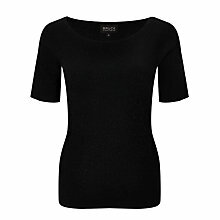 For a top to wear with skinny jeans, fitted trousers or smart jogger style pants (I love an elasticated waist band!) and heels, this pleated top is a great option. Again the sleeves are a nice addition for those who prefer a little bit of coverage and pleats are a good alternative for those who aren’t a fan of lace, sparkles or brocade . For me the way to test whether a top is up to the job is to stand sideways in front of a mirror. Breathe in, then breathe out as much as you can. If it doesn’t move over the tummy area, it’s a winner. So if you have any social events on the horizon and you’re currently caught in the headlights, this collection may well be one that’s worth investigating. Previous Post It’s chunky, it’s grey and it comes from Zara…. Next Post An outfit for lounging around in….